The Evolution Aqua Airtech 70 Air Pump kit comes complete with an Airtech 70 Air Pump, 4 way manifold, 10m airline and 2 air stones. The Evolution Aqua Airtech 70 Air Pump kit provides high performance using the very best diaphragm technology. The Evolution Aqua Airtech 70 Air Pump has been tested and proven to provide the highest output at any given depth, to be economical to run and totally reliable. Well engineered, robust and durable, every unit has thermal protection fitted as standard. The range was purposely developed for fishkeepers to deliver that essential element into their ponds - specifically air. The Evolution Aqua Airtech 95 Air Pump provides high performance diaphragm air pumps for all fishkeepers. The range was purposely developed for fishkeepers to deliver that essential element into their ponds - specifically air. The Evolution Aqua Airtech 95 Air Pump has been tested and proven to provide the highest output at any given depth, to be economical to run and totally reliable. Well engineered, robust and durable, every unit has thermal protection fitted as standard. Introducing the Evolution Aqua Airtech 130 Air Pump. The Evolution Aqua Airtech 130 Air Pump is a quality air pump and are purposely developed for fish keepers to deliver that essential element into their ponds - Air. Specifically, the Evolution Aqua Airtech 130 air Pump has been tested and proven to provide the highest output, at any given depth, to be economical to run, and totally reliable. Manufactured from aluminum, the Airtech 130 Air Pump is durable and robust. A weather resistant thermal protection device is fitted as standard. Oxygen is vital to all pond inhabitants whether these inhabitants are your livestock or the bacteria responsible for the breakdown of waste products. The primary functions of the Evolution Aqua Airtech 150 Air Pump is to "fluidise" the Kaldness media, and to maintain an aerobic environment for the bacteria. The Evolution Aqua Airtech 150 Air Pump has been tested and proven to provide the highest air delivery on the market at any given depth, and to be economical and totally reliable. The Evolution Aqua Airtech 150 Air Pump is weather resistant (manufactured from aluminium) and comes with a thermal protection device fitted as standard. Airtech Air Pump Diaphragm kits are very easy to fit yourself, The Airtech Air Pump Diaphragm Kit for the complete Airtech Range consists of everything you will need to renew the performance of your Airtech Air Pump. 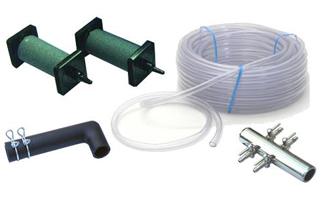 The diaphragms are invariably the item that needs changing so this Airtech Air Pump Diaphragm Kit is ideal for maintenance of your Airtech Air Pump at a fraction of the cost of replacing the whole pump. Airtech Air Pump Diaphragm kits are very easy to fit yourself, The Airtech Air Pump Diaphragm Kit for the complete Old Airtech Range consists of everything you will need to renew the performance of your Airtech Air Pump.